One of the easiest sales to make is to a referral, especially one from a client. Wouldn’t it be great if you had loads of people generating new leads for you and even making sales on your behalf? They would consistently put you in touch with your ideal clients, who would in turn become sources of even more business. Great news: You have just such a hidden, powerful sales team already at your disposal. 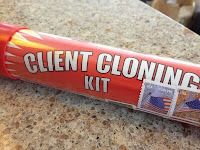 They’re your clients, colleagues, business associates, friends, and family. And every one of them could be a great referral source -- if you have a proactive, disciplined, measurable referral system that delivers every time. Now, I've got about a half dozen referral systems in my marketing business. But my MOST effective system is the simplest. It's this: Reward every referral, every time. When I tell this to most people, the typical response is: "Duh. I knew that." Then I ask, "You may know it, but are you doing it? Do you reward every referral, every time, without fail?" The answer, if they're honest, is often silence. Because most of us could do a better job at this. 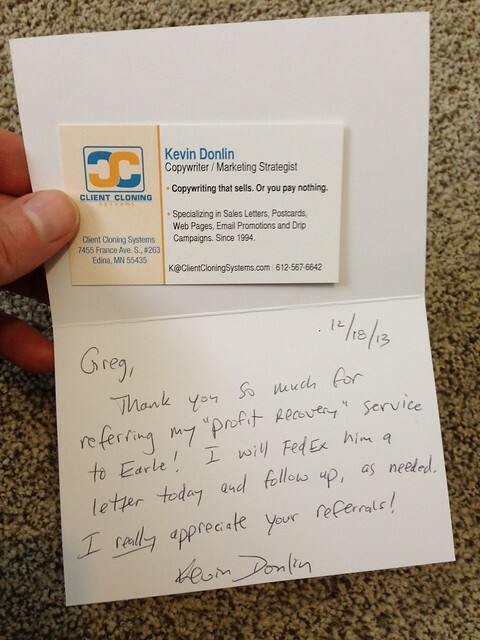 My client Greg sent me a nice referral opportunity to help one of his friends with my profit recovery service. So I rewarded him with a handwritten thank-you note that went out in today's mail. Note: The only reward here is a heartfelt thanks from me. No money or gifts need be sent, although I do send gifts for referrals that turn into sales, depending on the situation. But don't make this complicated. It's not. If you want more referrals, reward the behavior that produces them. By showing your sincere gratitude in the form of a personal, handwritten thank-you note, you can do that. Do it every time and you'll have a simple referral systems that works wonders for your business.